A male 51 y.o. admitted to us from a small town with the subject. Fell from height Oct 21, 2001. Traction was applied at the initial hospital. Other circumstances are some days of alcoholic delirium, pressure sores in the sacral area with redness around, an infected wire in the tuberositas tibiae (replaced on admission). Active smoker, and at all looks non-compliant, with no care about anything. Fracture site mobility is minimal. Available options are plaster cast, ORIF (plating), ex-fix and closed nailing. Each one has its negative sides. 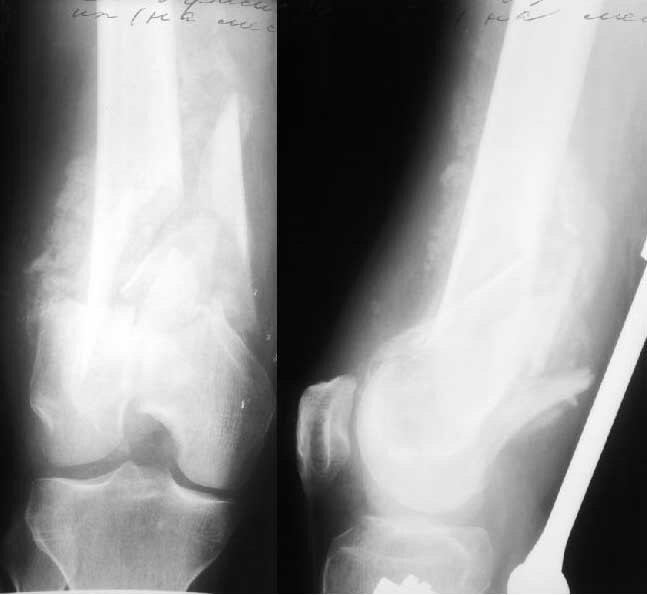 With plaster cast he loses knee motion and stays with malalignment, ORIF in almost 4 weeks since injury is a challenging procedure and risk of infection is significant, ex-fix would be able to correct recurvation but requires more compliant person, with closed nailing hardly ever the angulation can be corrected completely. What is your opinion about the case? I don't think he will be happy with that amount of recurvatum. He'll have relative hyperextension at the knee and loss of knee flexion that could interfere with his ability to walk and go up or down stairs. So eventually, he'll need osteotomy if you don't fix it now, which would be as technically difficult as fixing it now. 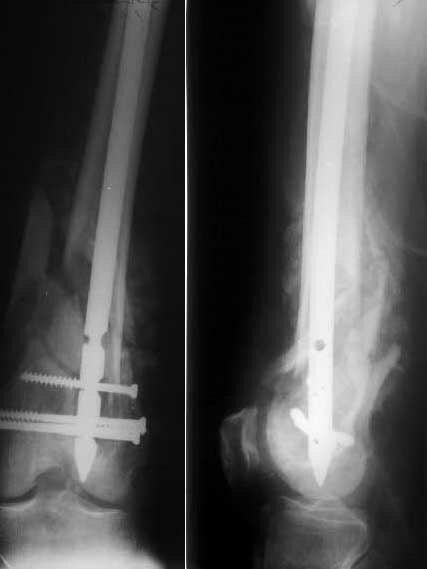 I'd suggest ORIF with plate fixation (DCS or blade most likely, although one of the newer fixed angled distal femur devices would be useful as well). It is probably solid enough to start flexion in a knee brace or cast brace. Any attempt at internal surgical fixation now would be extremely difficult if it is solid. Why don't you examine it under anaesthesia and if there is some movement still ,use one of your circular frames to correct the deformity in stages, as if it was a callotasis? This patient appears to have 45 degrees apex posterior angulation of a supracondylar distal femur treated in traction for 4 weeks. The joint is not arthritic nor involved in the fracture. His general health and compliance are poor. You have already shown us many similar cases treated with Ilizarov technique and I would think that would work in this situation. I agree with your list of options: Nonop (cast vs other), XF, plate and nail. 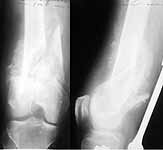 Certainly noncompliance is a problem for all forms of treatment but similar patients with this radiographic situation have been successfully treated with XF (gradual or acute correction). Ignoring the compliance issue for the sake of discussion, plating does have a risk of soft tissue complication/infection but not necessarily prohibitive. I think you CAN completely correct the malangulation with a nail (either antegrade or retrograde) but it would require a "nascent osteotomy" or open release at the fracture site. I have done this as a 2 stage procedure with release of callous/osteotomy followed by progressive traction/restoration of length for a few days followed by IM nail. 2 stages to try to avoid having the patient awake from anesthesia after one stage reduction/lengthening/nailing with a nerve deficit. In your setting, ring fixator seems like a viable option. Please give us info about these "new" fixed angled distal femur devices. It sounds very interesting to me...... what are these & are there any web-based info available about these things?? cw> still ,use one of your circular frames to correct the deformity in stages, as if it was a callotasis? He immediately started scratching around the traction wire and successfully reached redness and discharge around it within 2 days, so external fixator could be infected very quickly and we could get stuck with it.